Efficiency gains. When firms are privately owned, there is a greater profit incentive to increase efficiency. In the private sector, managers are accountable to shareholders, who will want a good return on their investment. For example, a nationalised industry may be reluctant to get rid of surplus workers due to political reasons (bad publicity). But, the private firm may be more willing to cut costs and improve efficiency. No political interference. In the private sector, there is a pre-commitment by the government not to interfere for political reasons. A private firm isn’t held back by politics. A private firm may be more able to raise finance on the stock market to invest. Privatisation also reduces the scope for corruption. Increased share ownership. UK privatisation programme saw a rise in share ownership. But sheltered monopolies could have little incentives to cut costs no matter who owns them. 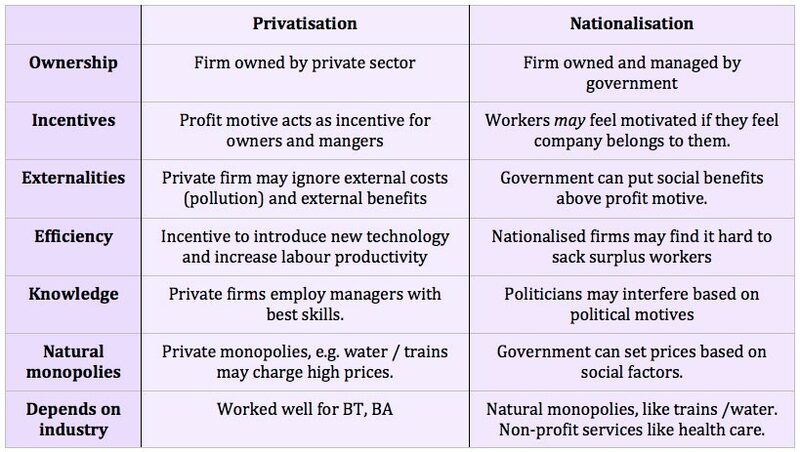 Privatisation will be most successful where there is potential for competition. Encourage efficiency gains as private sector look to cut costs. Increase in revenue which can be used to pay off debt, saved or invested. Privatisation can reduce the scope of government officials in business and diminish the potential for corruption.